We recommend the rubber anti fatigue mats, since they are versatile and keep costs down. Anti fatigue mats come in a variety of thicknesses, sizes and types. Give us a call and let us know what you are looking for. Our service area covers mid and northern Ohio, including Akron, Canton, Cleveland, Youngstown, Columbus, Dayton, and Toledo. You can contact us here – or give us a call 330-753-7225. 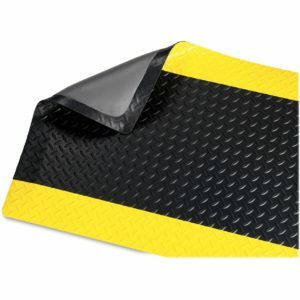 We can also help if you are searching for any of these types of items: fatigue mats, standing mat, anti fatigue floor mats, anti fatigue matting, anti fatigue flooring, commercial floor mats, industrial floor mats, anti fatigue rubber mats.